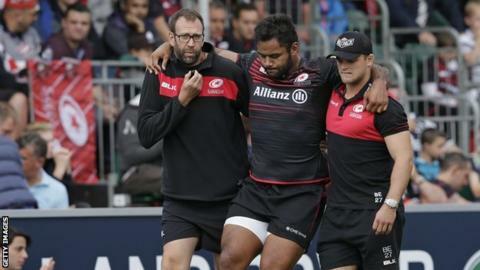 England and Saracens number eight Billy Vunipola will be out for four months with a knee cartilage injury. Vunipola limped off in the Premiership side's 41-13 win over Sale on Saturday. The 24-year-old underwent surgery on his right knee on Sunday and will now begin rehabilitation. Vunipola will miss England's autumn Tests against Argentina, Australia and Samoa so head coach Eddie Jones has added Harlequins' Jack Clifford, 24, to his training squad. The powerful back rower has 34 England caps, but last appeared for the national team in March after a four-month lay off following another injury to his right knee. He withdrew from the Lions tour to New Zealand in May with a shoulder injury and subsequently missed the start of Saracens' season. In addition to missing England's autumn campaign, Vunipola will also be absent for the start of Saracens' European Cup defence. "It's desperately disappointing for him, considering how hard he has worked during the off-season to get back to full fitness," Saracens director of rugby Mark McCall said. "Billy is a resilient character and he'll have a strong support network around him to get him back on the field in the best possible shape." England begin their autumn series against Argentina on 11 November at Twickenham.